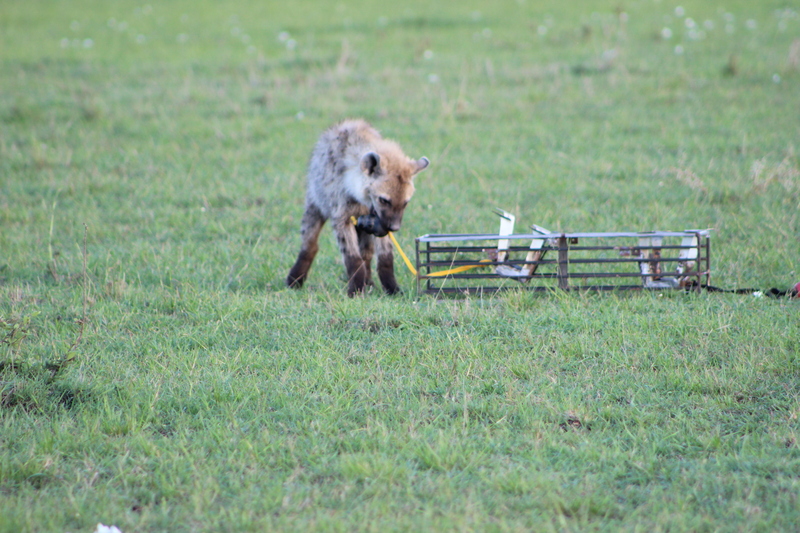 BEACON Researchers at Work: How fast can hyenas learn? This week’s BEACON Researchers at Work blog post is by MSU postdoc Agathe Laurence. “If monkeys could reach the point of being bored, they could turn into human beings,” said Goethe. More than a philosophical essay about boredom, that comparison between humans and monkeys is also a good illustration of what we now know about apes and monkeys’ cognitive abilities. In fact, as primates, we are a species that can claim one of the biggest relative brain size among mammals (Jerrison et al, 1973). However, you would be surprised by what some birds can do, or even honeybees (Komischke et al, 2002). Of course it all depends on what kind of cognitive tests you are considering. But, cognition can be divided in two categories: physical and social cognition. While the first helps us deal with inanimate objects, we are able to understand our conspecifics intentional actions, perception, and knowledge, thanks to the latest (Herrmann et al, 2008). Obviously, social cognition is most useful when living in a big enough society, which means frequent encounters with conspecifics. As a matter of fact, social complexity could be what drove individuals to have bigger and bigger brains throughout evolution (Byrne & Whitten, 1988). This indicates that living in a complex society involves the need to understand its social rules, as well as to predict and/or understand the intentions of your conspecifics, especially if they’re higher ranking. 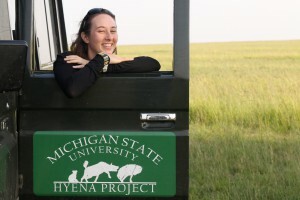 Even though I used to work with non-human primates, and then birds, it is the spotted hyenas studied by Kay Holekamp and her graduate students that have brought me from France to Michigan State University. Throughout 26 years of research about their anatomy, ecology, physiology and behavior, Holekamp and her collaborators have shown the complexity of their social groups (Holekamp et al, 2007). 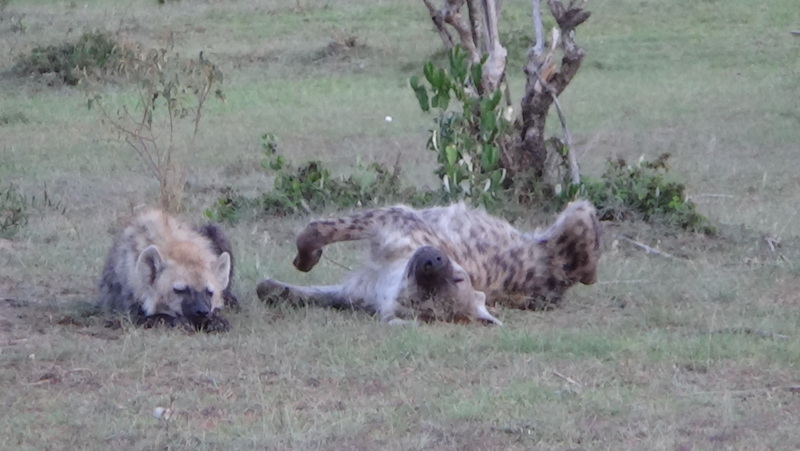 First of all, spotted hyenas (Crocuta crocuta) are the subject of many myths, so let’s reestablish some truths about them: they are not hermaphrodites, 80% of their food is what they hunt for themselves, and they are not ugly (although that might be a personal bias, but see Figure 1). Regarding social characteristics, they actually exhibit a lot of similarities to primate societies, particularly old-world monkeys (e.g. baboons or macaques). A group of hyenas, called clan, can contain up to 90 individuals, each of which is able to recognize every member. There is strict linear hierarchy within the group, where females are dominant, bigger, and more aggressive than males. Overall, they meet the criteria to fit the social intelligence hypothesis. Like monkeys, hyenas have a high level of social cognition: the acquisition process of one’s social rank happens through learning. Only then they are able to identify every conspecific’s social rank, predict the issue of an interaction between two other hyenas, and join other hyenas in an aggressive coalition against a third one. On the other hand, we know very little regarding their physical cognition, and that is the focus of my work with wild spotted hyenas in the Maasai Mara, Kenya. The social intelligence hypothesis predicts a high level of physical cognition along with social cognition. The key is to choose a task that can be done by several species, so that a wide comparison between species is possible. Let’s forget about IQ tests right away, only a chimpanzee would give the pen back when he’s done. Behavioral flexibility, or the ability to adapt one’s behavior to solve a problem, is a good measure of general intelligence and can be adapted through various tasks. 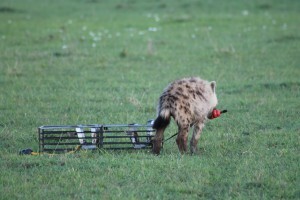 The hard part was to choose a task that hyena could solve without the use of hands, as most of the experiments have been conducted on primates. Moreover, wild hyenas are very cautious toward man-made objects, hence I chose a task that could be done in several steps, to eliminate any bias of novelty on their ability to solve the task. 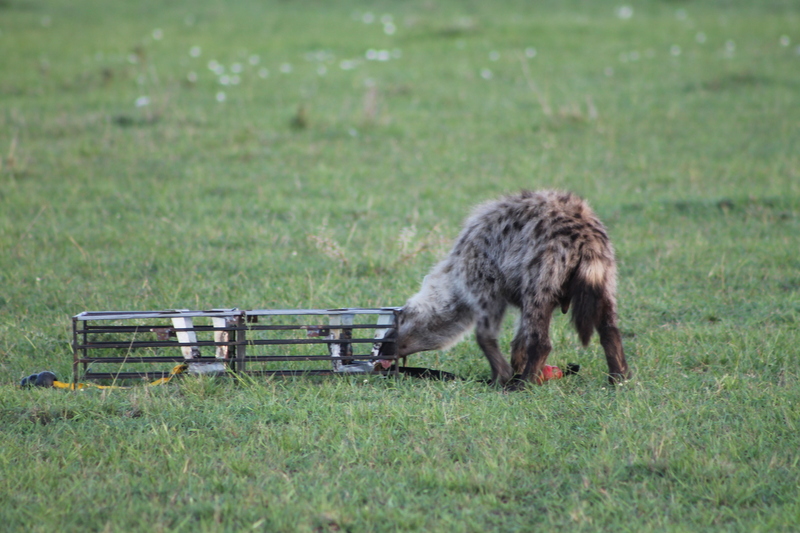 So, to test their ability to display flexible behavior, I’m using a reversal learning test where the hyenas have to pull ropes to get access to meat as a reward (Figures 2 & 3). They first have to learn to discriminate between two colors (black versus yellow), one associated with the reward, the other one associated with the absence of that reward (Figure 4). Once they have learn that, the rewarded and the non-rewarded colors are reversed and they have to suppress one behavior in favor of another to get the meat. 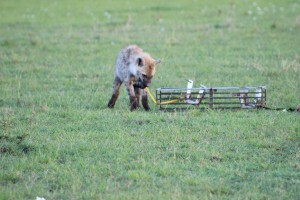 Figure 2: That young subadult is pulling the rope so that the tray containing the meat slides to the edge of the device. Figure 3: After pulling the rope, the same hyena can get the meat and thus associate the color of the rope (here, the black one) with a positive reinforcement (the meat). 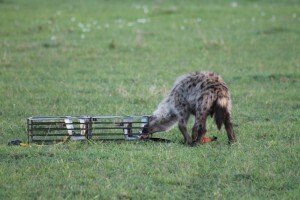 Figure 4: After getting the reward on the “black side”, this hyena is trying to get the meat on the “yellow side”, which is blocked and the meat will remain inaccessible. After several trial, that hyena will learn to pull only the black rope. 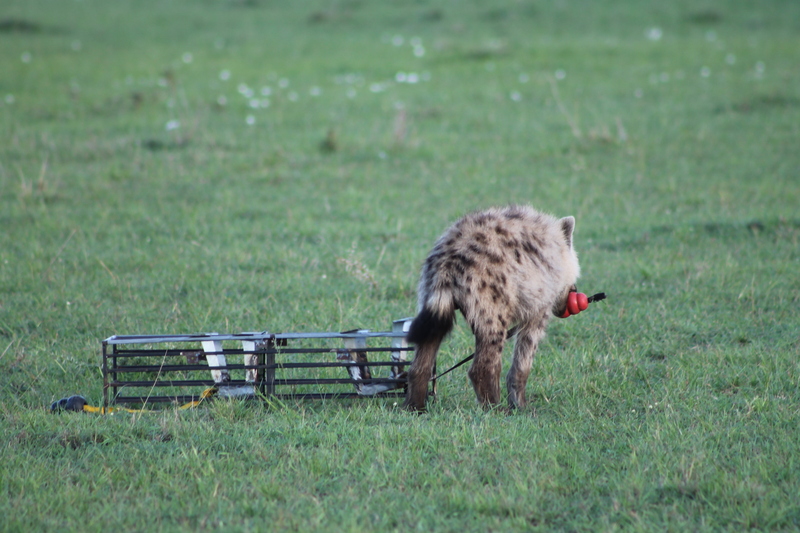 Conducting an experiment on wild hyenas takes time, especially when I have to find them across their wide territory and to get them to interact with the device. After a very long habituation phase, I have now started the learning phase, trusting that my beloved subjects will learn it quick (because I believe that they are very smart). Then, the best part begins: reversal learning! I went to Rennes 1 University in France, where I graduated with a Master’s degree in ethology studying hand preference in non-humans primates and then received a PhD studying the impact of chronic stress on behavioral development in birds. Afterwards I wished to study more specifically behaviors in a social mammal. 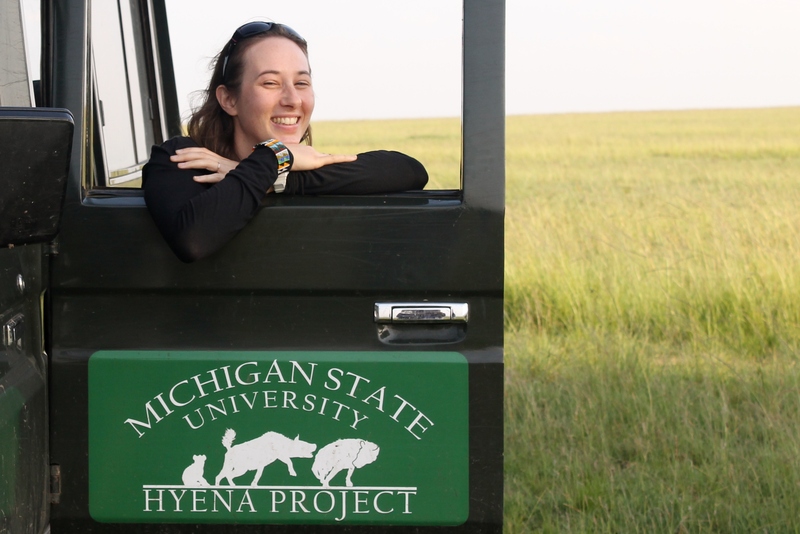 I won a 2-year grant awarded by the Fyssen foundation (website) to study cognition in wild spotted hyenas at MSU. Byrne RW, Whiten A (1988): Machiavellian Intelligence..Oxford, Clarendon Press. Jerison HJ (1973): Evolution of the Brain and Intelligence. London, Academic Press. Hermann et al (2007): Humans have evolved specialized skills for social cognition: the cultural intelligence hypothesis. Science (317), 1360-1365. Holekamp et al (2007): Social intelligence in the spotted hyena (Crocuta crocuta). Phil. Trans. R. Soc. B (362), 523-538. For more information about Agathe’s work, you can contact her at ag dot laurence at gmail dot com. This entry was posted in BEACON Researchers at Work and tagged BEACON Researchers at Work, Biological Evolution, cognition, Field Biology, hyenas, intelligence. Bookmark the permalink.